Apple iPhone 5S complete screen replacement in white. 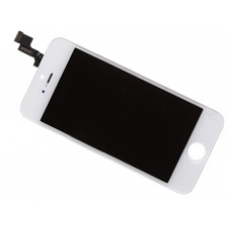 This white iPhone 5S screen comes complete with the LCD and touch screen, if you have broken your LCD or glass touch screen or both this is the correct white iPhone 5S part, this complete screen makes replacement of the display on your iPhone 5S simple and straight forward. Can you confirm that when it says original quality that it is an after market product but of exactly same quality? So you would not notice a difference in screen clarity. Does this part have all the cables attached to wire up to phone or do you have to remove anything from the existing broken screen? This iPhone 5S complete screen uses an original Apple LCD display however the touch screen (digitiser) is an aftermarket part of the highest quality, the clarity is the same as an original screen part. We offer a full 12 months warranty on all our replacement iPhone 5S screens, you will need to remove the home button from your broken screen and the earpiece and sensor cable, and fit into this replacement screen part.